It had all started innocently enough. Nine year old Eleanor Abbington was to kiss her new cousin by marriage. However seven year old Nicolas Norton had used this opportunity to get the best of her. It was the start of one-upmanship that would span a decade and a half. There was truly only one highlight whenever Nick returned home. Eleanor. He might taunt and torment her, but she came alive whenever she parried his attacks. Either verbal or fencing. Now, however, Eleanor is anything but the vibrant woman he has come to know. She is subdued. Haunted even. And he is determined to do whatever is necessary to bring out the Ellie he knew. Eleanor was happy to see Nick returned safe, and he did provide a distraction to the horrible truth her future now held. Her uncle, Nick's step-father, was forcing her to marry for his political gain. She can see no escape. Luckily for her, Nick has a plan to have her ruined by a rake. 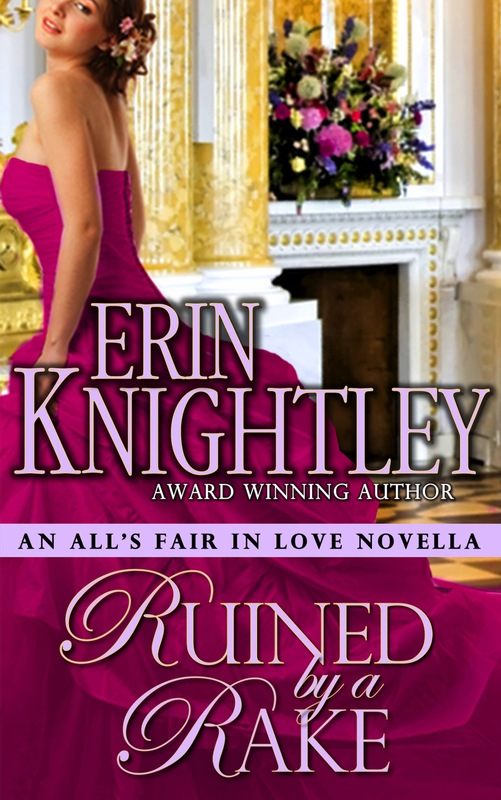 Ruined By a Rake is a sweet novella where the hero and heroine have allowed years of competition to hide a growing attraction. Eleanor is quite happy to remain on the shelf. Independent and able to do as she wishes. Forced into accepting an unwanted marriage proposal, she doesn't realize that the younger boy who had once irritated her is now a man willing to step forward and rescue her so he can claim her as his own.